Graphene is the world’s first 2-D material. It is 200 times stronger than steel, thin and transparent with innumerable potential applications for its use. The Graphene Engineering & Innovation Centre at Manchester University required a plant to collect and treat the very varied laboratory liquid waste discharges at the site to ensure environmental compliance before safely discharging it to foul sewer. The solution needed to be robust as the wastewater flow and quality can vary significantly. Wastewater collected from the laboratories flows to a network of collection pipes and from there is transferred by pumping systems to the treatment plant, where it is collected and treated in three separate tanks. This approach means that the incoming wastewater can be monitored for its content and diverted out of the plant if necessary. 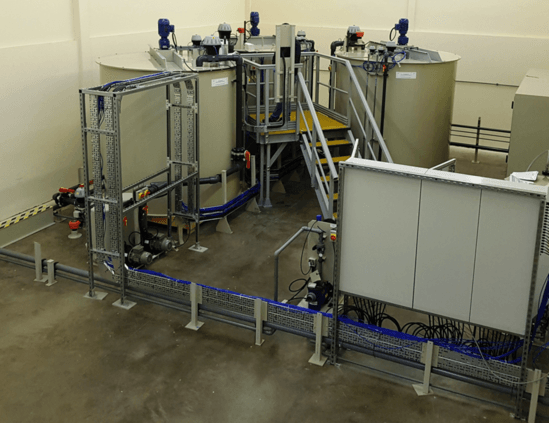 Chemical treatment is automatic and, when complete, the wastewater quality is automatically checked for suitability to be discharged to foul sewer. The plant was completely pre-fabricated at H+E’s Whitburn facility where factory acceptance tests were carried out with the client. The whole system was then partially disassembled and transported to site for installation and commissioning. This allowed far greater control of build quality than a more conventional site build approach. The prime reasons for this are to both improve the quality of equipment supplied and also minimise installation time on site. These continuously-uprated targets are totally in-line with H+E’s philosophy of Continuous Improvement.